Dates of birth and death unknown. Disciple of Hanagiri Heihachi. 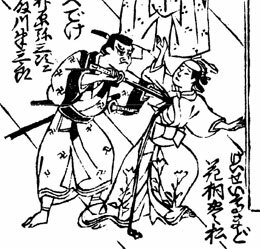 he received the name of Hanagiri Toyomatsu I and started his career in Ôsaka in 1716, performing as a koyaku. He became wakaonnagata/iroko in the 11th lunar month of 1718 at the Naka no Shibai, where he played the role of Ne-no-Hi-no-Mae in the kaomise drama "Sumiyoshi Tanjôseki", which was produced by Takeshima Kôzaemon II. He switched to wakashugata the following year, playing the role of Sakichi in the 11th lunar month of 1719 at the Higashi no Shibai in the kaomise drama "Odaki Medaki Kogane no Hajimari", which was produced by Arashi San'emon III. He became wakaonnagata in the 11th lunar month of 1724, in Ôsaka at the Kado no Shibai, where he played the role of the koshimoto Omaki in the kaomise drama "Banzei no Minato", which was produced by Arashi San'emon III. He switched back to wakashugata in the 11th lunar month of 1725 in the same theater, playing the role of Kashiwagi no Emon in Kaneko Kichizaemon's kaomise drama "Wagô no Futabashira". He switched back to wakaonnagata in the 11th lunar month of 1730 in Ôsaka at the Naka no Shibai, where he played the role of the keisei Wakamurasaki in the kaomise drama "Meotogura Wagô no Nakatomi" which was produced by Iwai Hanshirô III. His last-recorded performance occurred in the 11th lunar month of 1735, in Ôsaka at the Kado no Shibai, where he played the role of Princess Tamate in Sadoshima Saburôzaemon's kaomise drama "Ôyamato Kane no Kinzan" which was produced by Nakayama Shinkurô I. He most likely died in 1736. His last ranking, in the 1736 Ôsaka hyôbanki (wakaonnagata section), was jô-jô-(shiro)hankichi (superior - superior - (white) half excellent). He was said to be outstanding in musume and keisei roles. He was the father of Hanagiri Toyomatsu II and his haimyô was Fuchi. 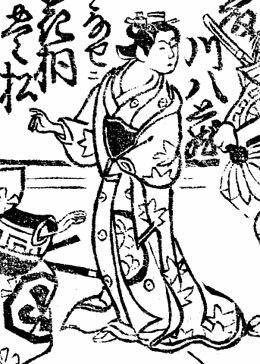 There will be in the future to come a full page dedicated to Hanagiri Toyomatsu I in kabuki21.com. Dates of birth and death unknown. Son of Hanagiri Toyomatsu I, his first stage name was Hanagiri Hatsumatsu. Later, he received the name of Toyomatsu Wakatarô. His father most likely died in 1736 and he took the name of Hanagiri Toyomatsu II in the 11th lunar month of 1737 in Ôsaka at the Naka no Shibai, where he performed as a wakashugata in the kaomise drama "Fukakusa-no-In Sannô no Maki" which was produced by Nakayama Shinkurô I. He switched to wakaonnagata in the 11th lunar month of 1745, playing the role of Sanai's sister Otsuru in the kaomise drama "Onna Musha Ukisu Gassen" which was produced by Ichiyama Sukegorô I. No record of any stage performances afterwards. The actor Hanagiri Toyomatsu III held this name from the 11th lunar month of 1756 to the 10th lunar month of 1781, then from 1st lunar month of 1789 to the 2nd lunar month of 1796.